Can't find a job that interest you or there is simply no position available at this time? Submit us your application anyway! At Assumption Life, you will find jobs in various fields: legal services, actuarial services, pricing, strategic partnership, audit, finance, accounting, IT, mortgages, sales and marketing, group and individual product administration, investment and retirement, human resources, remuneration, building management, etc. Please note that your application will be kept in our files for the next 6 months and that we may join you if we believe that your skills, reflected in your résumé, match well to those asked in a future job posting. We strongly encourage you to apply directly for the posted positions that interest you, as direct applications for a position are preferred during the hiring process. At Assumption Life, we value the development of our employees in diversified and inclusive work teams that foster creative thinking and innovation. The Company was founded in 1903 to help people. Today, this culture of generosity and commitment is demonstrated by our actions and our values. In 2017, we proudly obtained a B Corp certification. 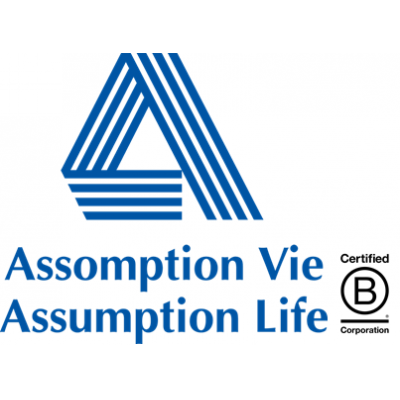 Assumption Life is the first life insurance company in Canada and the 200th Canadian company to obtain this prestigious certification. B Corp certification is a social movement involving over 2,000 companies worldwide that share a common vision of a business community that is committed to improving economic, social and environmental well-being. Whether it is helping out at special events, raising funds for a charity or, helping people in need, Assumption Life employees are very committed to their community and are always ready to help. In 2017, Assumption Life received the Aon Hewitt's Employers of Choice platinum category for small and medium-sized organizations. We ensure competitive salaries, as well as performance-based bonuses, generous benefits and flexibility in our policies and practices to respond to the needs of our employees. "Our success is based on the loyalty, knowledge and passion of our employees. We know how important it is to create a dynamic and motivating work environment to mobilize and recruit the best in the market."